The Rakthakanta Swamy Temple and the annual cattle fair held in the Malayalam month of Meenam are the main attractions of Omallur. People from both within and outside the State participate in the fair. The goddess at the Bhagavathy Temple here is believed to grant boons to devotees and help them realise dreams. The temple has beautiful wall paintings and artistic stone carvings. The Kadamanitta Devi Temple is famous for the ten day long Padayani performances held in connection with the annual festival in April/May. The memorial to Muloor, a renowned social reformer and poet, is located at Elavumthitta. The water of the Chilanthikinar (well) in the premises of this temple is believed to cure skin diseases. Kodumon is also the birthplace of Sree Shakthi Bhadra, author of Ascharya Chudamani. People of all castes and creeds are permitted into the temple. However, entry is not allowed to women between 10 and 50 years of age. Pathanamthitta – 65, Pandalam – 80, Adoor – 81, Chengannur – 93,,Thiruvalla –102, Punalur – 101, Ochira – 116, Alappuzha (via MC Rd.) – 137, Kottayam (via Pathanamthitta - Kozhencherry, Thiruvalla) – 130, Thiruvananthapuram (via Pathanamthitta - Adoor) – 180, Kottayam (via Manimala) – 116, Kodungaloor - 275, Guruvayoor – 288, Palakkad – 330, Kozhikode – 388, Kannur – 486. This is the main halting point on the way to Sabarimala. It is also known as Thriveni Sangamam - the meeting point of three rivers. The Parthasarathi Temple (dedicated to Sree Krishna) on the banks of the holy river Pamba attracts large crowds of devotees. 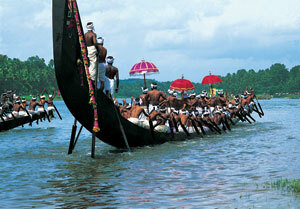 The famed Aranmula boat race is held on the last day of the weeklong Onam festival. The Vijnana Kalavedi at Aranmula imparts training in the traditional arts like Kathakali, classical dances, classical music, as well as Kalaripayattu. Foreign tourists stay here for long periods to get a first hand knowledge of the culture of Kerala. The Parthasarathi Temple here has fine murals from the 18th century. Aranmula is also famous for its metal mirrors, a unique craft which is not found anywhere else in the world. 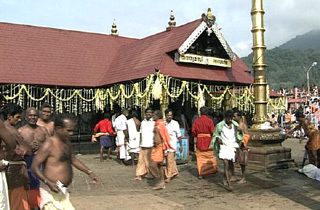 The old Siva Temple on the Pamba - Pathanamthitta Road is an important place of worship. The estate of the Farming Corporation and the Ecumenical centre of the Christians are located here. 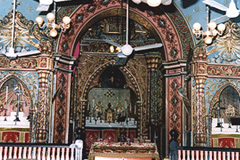 As a holy town, Pandalam is perhaps second only to Sabarimala. Sree Ayyappa, the presiding deity of Sabarimala had his human sojourn here as the son of the Raja of Pandalam. The Valiyakoikal Temple near the palace on the banks of River Achenkovil has been modelled on the Sabarimala shrine. Pilgrims usually stop here to worship before proceeding to Sabarimala. Three days prior to the Makaravilaku festival, the sacred ornaments of Sree Ayyappa are taken in a procession from Pandalam to Sabarimala. The Ormaperunnal (commemoration day) of Mar Gregorios Metropolitan, the declared saint of Malankara Orthodox Church, is celebrated on the 1st and 2nd of November. An important religious convention of the Hindus is held at Cherukol on the riverbed of the Pamba, usually in February every year. Situated on the banks of the Manimala river, Kaviyoor is famous for its temples. The Hanuman Temple stands on a small hillock and is built in the gable style architecture peculiar to Kerala. Situated near Kozhencherry, Maramon is the venue of a mammoth religious convention of Christians from all over the world. It is attended by people from all communities. The convention which is usually held in February is addressed by religious thinkers and Christian scholars from across the world. This is perhaps the largest Christian convention in Asia. Gajamela at Parthasarathy Temple, Adoor. Thaipooya Mahotsavam at Sree Subramanya Swamy Temple. Utsavam at Sree Parthasarathy Temple, Aranmula. Utsavam at Poruvazhi Malandam Temple.